So, earlier in the week I was whining about how the last painting had grown cold and how difficult it was to finish because I wasn't in love with it anymore—blah blah, blah—the usual artist angst. Well, this new painting flew together like an instant cake mix. I started it one evening and finished it the next. Whoosh! It happened so fast that I'm still in love with it and adoring every loose, lively, and colorful brush stroke on the canvas. Every time I walk past it, I smile because I held the mood I wanted through completion. Sometimes the fast ones are the most satisfying. I think my success was partially due to the thrill of starting something new after the last piece dragged itself wheezing to a finish. It was as though I'd finally chewed through a tether, breaking free into a new adventure of light and color. Another reason this painting was only 12" X 9", so there was less ground to cover, so to speak. When we drove through New Mexico, we made a side trip out to a trading post. Yes, a real trading post. It was something out of an old western: dusty and jammed with an odd assortment of old and new. An ancient wood burning stove greeting us at the door, sullenly smoking. Around the perimeter, shelves lined with cans of spam, soup, beans, a couple bags of potatoes. A small freezer held a meager assortment of meat. A side room held huge piles of intricate rugs in every size and color, woven by local Navaho women. Although intriguing, it felt like a very sad place to me. I wasn’t there long enough to know the intricacies of life there, but it oozed conflict; like two fists pounding against each other every day, each unhappy and sore from the impact. Outside, looking out over the vibrant landscape, it didn't feel that way. It felt open and vast and free. I started out going gangbusters on this painting; but then life got a little hectic and I couldn’t get back to it while the coals of excitement still glowed. In fact, the coals cooled completely on this baby. I think I’ve shared this type of experience before: if I don’t finish a piece while I’m still in love with the subject, completion can be prolonged and painful. Minutes after I signed my last piece, I broke out a new canvas—eager to set sail on a new journey. It was getting late in the evening, so I quickly blocked out the basic composition, dreaming of that cool fall day next to the stream. Luckily, I was able to come back to the beginnings of the piece the next night, and a few days later spent a long delightful afternoon working, taking it near to completion. I placed the painting in the viewing area to study and determine the finishing touches. While bouncing around the floor to my exercise video, I figured out what needed to happen next. Some people read while they are on the treadmill, I do aerobics and look at my paintings. However, even though I knew where I wanted to go next with this piece, it took a couple of weeks to get back to it. My weekend afternoons were absorbed by chores or hiking (the latter an acceptable excuse). My evenings busy with other obligations. By the time I returned to the painting again, it was cold, cold, cold. I had to burst through the wall of resistance and boredom to complete it. That’s what I call it—the wall. If I just keep beating my head against it (in other words, keep painting), I break through and the flow begins again. We camped beside Wet Beaver Creek on one of the last nights of our honeymoon in November. I wish we could have stayed longer; it was such a pretty spot. On the far side of the creek, the banks were choked with vegetation. An array of bright greens and yellows and golds stood out against a dark wall of lichen-covered rocks that defined the gully where the creek traveled. A cobble of water-smoothed stones made a beach on the near side, bordered with slender sycamores wearing glowing leaves of bronze and amber. It was a peaceful place to camp, although some might have been put off by the waddling skunks that joined us that night, rubbing against our ankles while looking for bits of dropped food under our table. We stayed very still, speaking in soft voices, trying to calmly continue our game of Scrabble. We could smell them before we could see them. Once there were no scraps of food found (or left), they moved on to the next campsite, where a boisterous bunch of boy scouts stomped and hollered, chasing the skunks back into the brush for the night. I started a new piece last night—again, moments after finished this one—and I'm very excited about my progress so far. It’s another image from the same trip. The color is intense and I plan to keep it that way—a landscape filled with the rich glow of late afternoon. I have a busy week ahead of me, with company coming for the weekend. Keeping the flow going on this next piece may also be a challenge. Wish me luck! Looks like a bunch of paint blobs, huh. That's because I was being painterly. 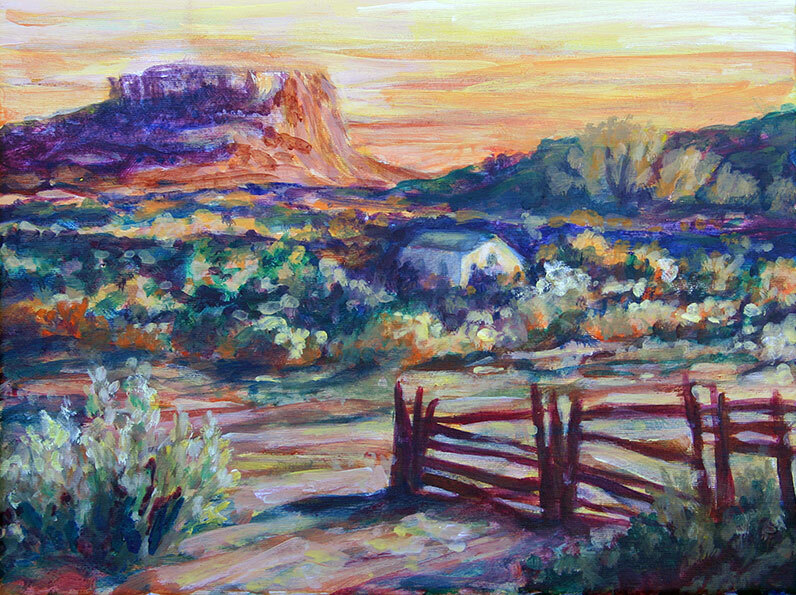 I was admonished by one of my loyal readers for not sharing the art story behind the Silverton painting (click here to see it). There’s always a story behind each piece, because each one is an adventure in art. You might remember I was a little nervous about this painting because the subject matter was outside my usual repertoire. I wasn’t worried about the background; it was the rail car that concerned me. 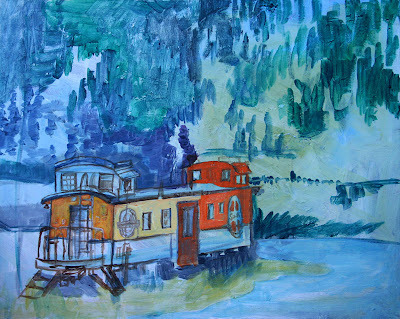 However, from the beginning, I had decided to approach the subject in a loose and painterly manner. I didn’t want the extreme detail that would make it look like a photo. See how bumpy the canvas is? Added to that, I started with a recycled canvas. I painted over an old piece that sat in the “maybe” pile for years. It had a lot of paint on it, the subject being a band of exuberant street musicians, so there was a great deal of texture on the surface, which added to the approach. 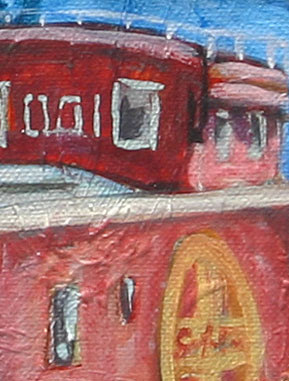 There are plenty of artists who paint trains that are perfect—right down to the number of rivets. That’s not me and it never will be. As one of my professors in college said, "If you want it to look like a photo, why not just take a photo?" The point being that your interpretation and the natural imperfections of the art process that go into a painting are what make it uniquely your own—and make the art more interesting too. Here's an early version of the piece. But my worries were unfounded. The rail car nearly painted itself. I mean, I painted it, but it was not on a conscious level. 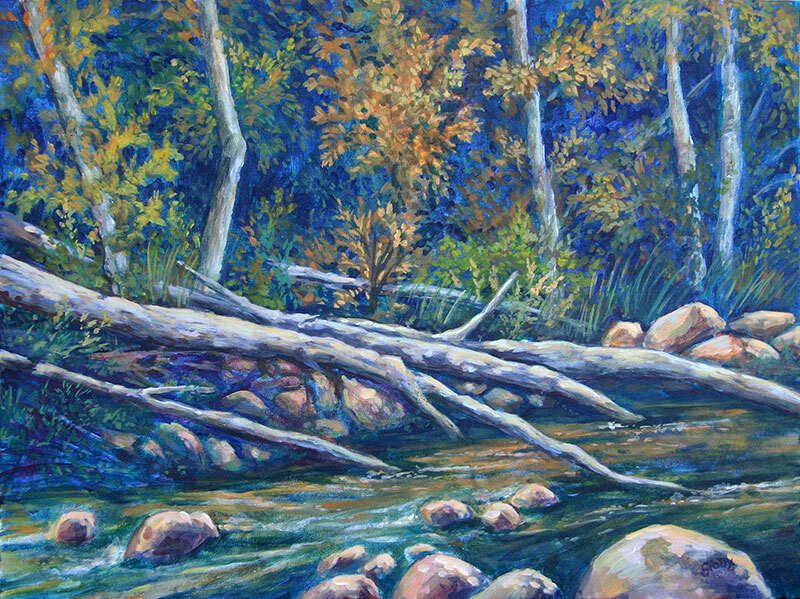 Often when I paint, it’s akin to meditation. I’m there, but I’m not there. I’m making color and value and brushstroke decisions, but it’s more on an unconscious or instinctive level. It’s shapes and color and texture that are pictured in my head. No words, no solid thoughts that I could verbalize. 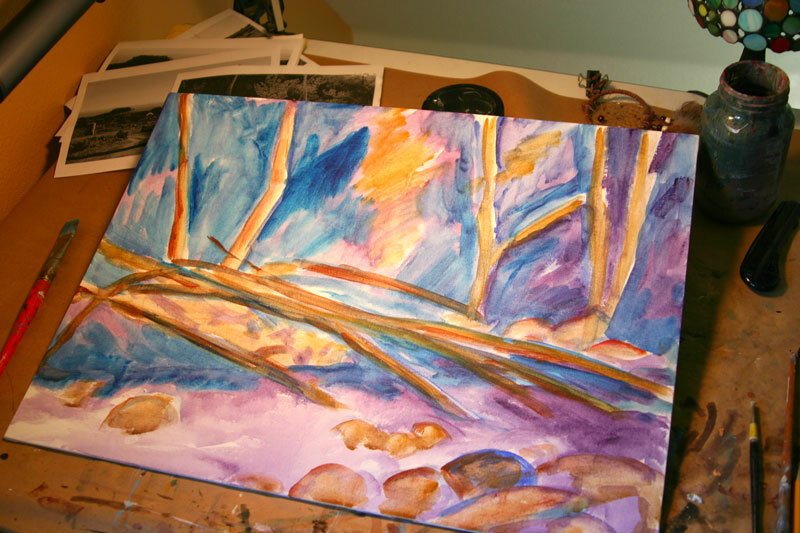 When I am finished painting for the evening, I rinse my brushes and leave the studio. I rarely take the time to evaluate my progress. I wait until I return to the studio. Upon my return, it’s always a little bit of a surprise—"Wow, how’d I do that?" That thought might be positive—or negative. 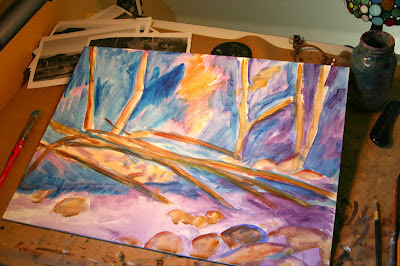 Then, I determine my next step and dive back into my painting meditation. The painting of the rail car was much like that—completed while in a richly satisfying and relaxing meditative art state. 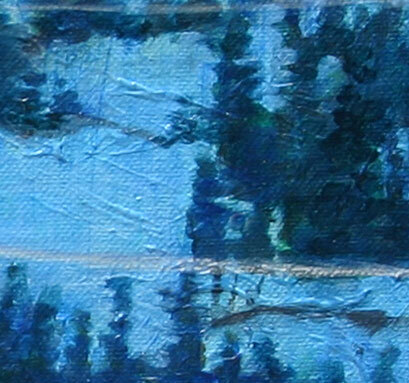 It was actually the background where I struggled to find the right value and shade of blue for the deep winter shadows. No color dreaming my way through that part of the piece. It required focused trial and error until I stumbled upon just the right color mix and transparency. I'm hoping to make some headway on this tonight. In my new piece, I return to one of my favorite subjects, water. Specifically, a beautiful stretch of Wet Beaver Creek. Yes, those early settlers were a randy bunch, weren’t they?